I’m a Winner! And: Who’s that Maker? First up: the door prize. I got four entries. There were several door prizes to choose from, and each one had it’s own jar. I could put all my entries in one or split them up. I was torn between a lovely handsewn tote bag and a wonderful rainbow dotted cup, and ultimately decided I have a lot of tote bags (I think it’s a legitimate addiction) so I’d go for the cup. With four entries, I felt pretty good about my odds. And I won it! See how cute it is? I’m pretty sure each little dot is hand-painted. I can’t imagine how long that took. But I absolutely love it. 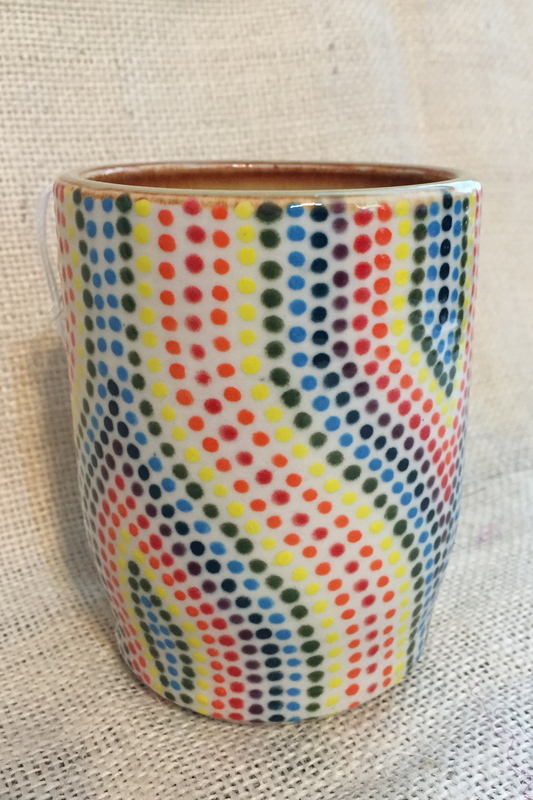 It was made by PiCeramics, and she’s got a lot of beautiful cups, vases, pitchers and more. Then it was time to spend my gift certificate. That was hard. I looked at GeekChic because I just love her nerdy handmade bags. She’s the one who made my awesome Doctor Who tote. And I looked at PiCeramics, but I needed to stay close to my budget, and her pieces had a deservedly higher price. 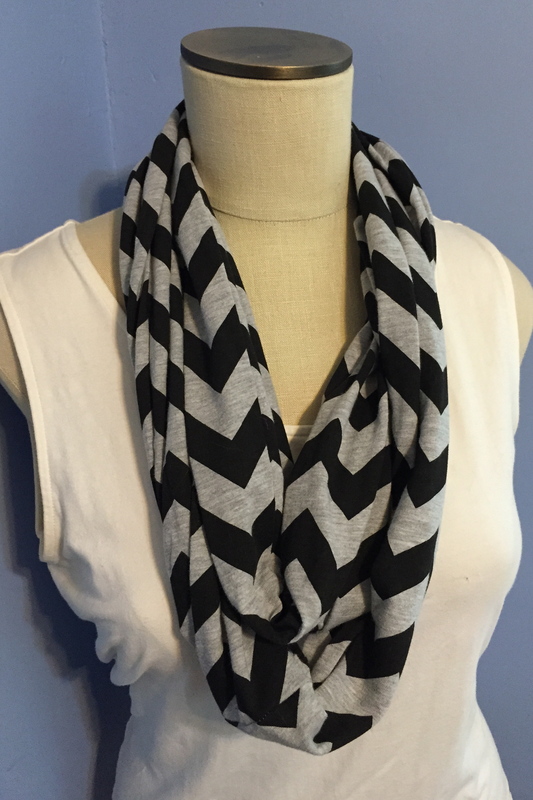 But I kept going back to this booth of infinity scarves made with soft jersey-type fabric. I covet them every time we go to Ugly Glass, so it just seemed like destiny. I picked out two. I love them. I put the blue one on right away, and I wore the gray/black one yesterday. I’m already trying to figure out what else I can wear them with. Sadly, I didn’t pay enough attention to the name of the booth, and the tags were removed when I bought them, so I can’t tell you the name of the maker, and I hate that. I think more makers need to consider what goes home with their items. My cup came home with a tag that had a pi symbol on it, but I still had to go to the Ugly Glass website to get more information. For the scarves, I came home with no tags whatsoever. There are several clothing/accessory vendors listed on the website, and I have no idea which is which. I bought an adorable bag for my niece’s birthday at the craft show on Saturday, and I have no clue what her business name is. 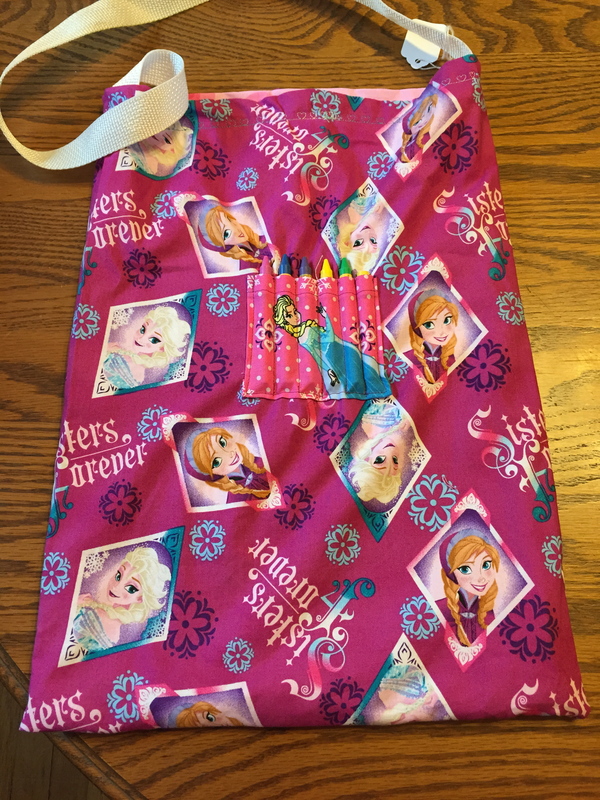 I think it’s so neat how she has the little slots for crayons on the front, and it came with a Frozen coloring book. Plus there’s room for a few other things, so it’s perfect to take to church or out to dinner, things like that. I wish I could direct you to her, but I can’t because I forgot to get a business card and the tag only has a price. So, a note to vendors: think about attaching a tag with your information on it. Or punch holes in your business cards and attach one of those. I put two tags on my items, one with a price and description, and one with my name, email, website, Facebook and Etsy. I want to make it as easy as possible for you to find me later. 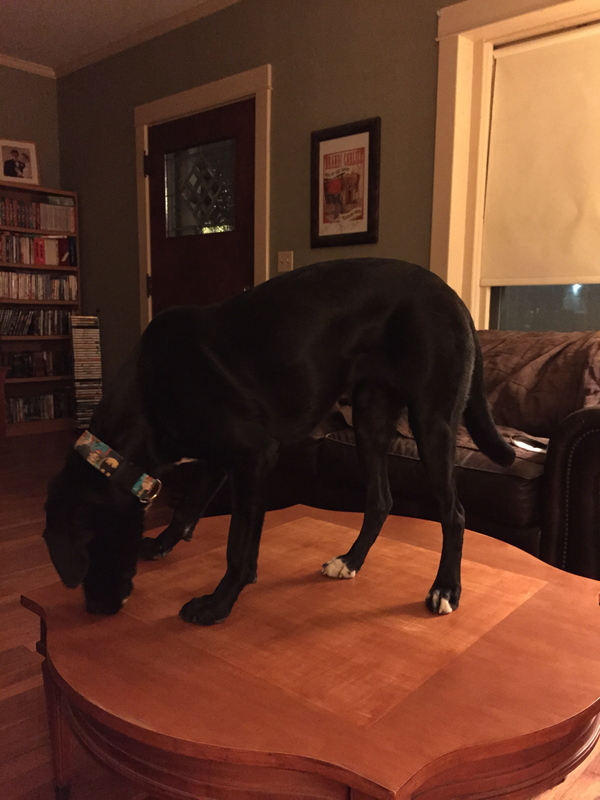 Today’s puppy photo is brought to you by Grace, who seems to think she must be higher than the rest of us and therefore claims tables. ← Just keep making, just keep making! Great comments for makers of all handmade items! Thanks for that Bonny. Another great post, thank you! And we love hearing a customers perspective. Dannielle shared this with the makers to read as well, great advice to share! Great! 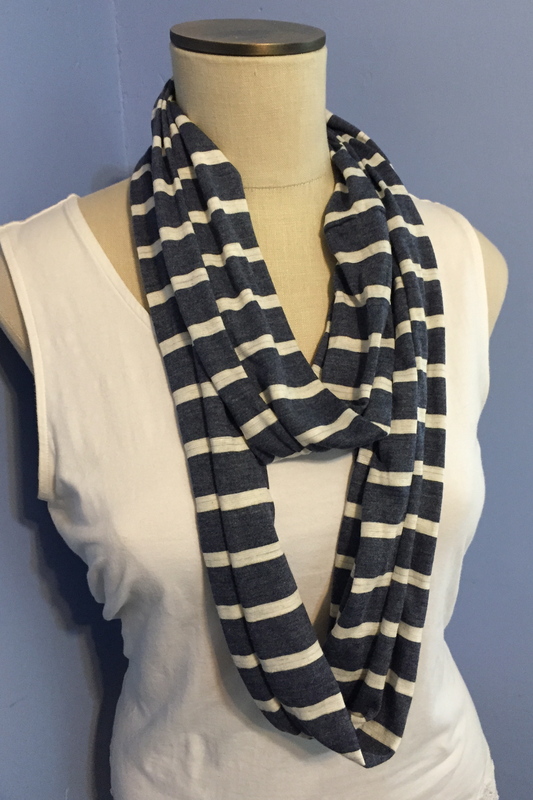 I’d love it if you’d post the name of the scarf maker in a comment! I love your cup and that little frozen bag would be sure to keep a little one entertained for a while. Those scarves are great. Good luck finding out more info.